In the newly-published 2015 U.S. Multichannel Customer Service Report from Microsoft Dynamics CRM and Parature, from Microsoft, 92% of consumers surveyed said they now expect brands and organizations to offer a customer self-service support portal. And while many brands and organizations do have an online self-service offering, it’s not been built with customer ease in mind. Customers must roll the dice with their available time, navigate a sometimes crazy maze, and hope to find the information or issue resolution they’re looking for in (relatively) quick time. 1. Think Like Your Customers. But this doesn’t mean that the benefit is all one-sided. Their same research notes that the best customer-focused and -facing innovation is derived at the intersection of “technological feasibility, customer desirability and business viability.” where the product or service benefits all sides. In the case of self-service, a portal designed with customer ease and desirability in mind would deliver greater customer satisfaction and retention, as well cost savings through reduced volume to higher-cost, higher-touch service channels such as phone and email. 2. Better Yet, Ask Your Customers. 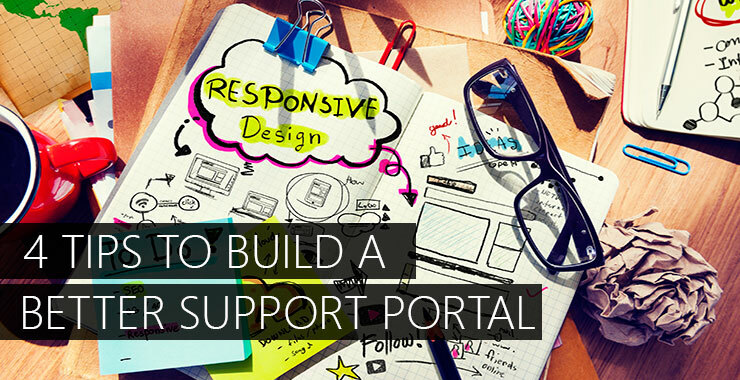 While it’s terrific to think like your customer when developing or redeveloping your self-service portal, it’s even better to ask them directly. Select customers to be part of your ideas and testing team, and be sure to add feedback and survey tools to your finished product (or perhaps better said, your self-service portal in continuous progress). Think you don’t have time to get customers involved, or you would like to but you have an internal project deadline that’s looming? The John Wooden quote is a proper share in this case: “If you don’t have the time to do it right now, when will you have the time to do it over?” Or consider this: Gartner Research estimates that by the end of 2016, at least 80% of organizations that fail to plan their self-service implementations will incur higher customer service costs and will not achieve the savings and benefits expected.Small customer desires or requests – which can include anything from not having to log in for self-service support access, adding an alert bar for ease in finding information on trending issues or support statuses, or suggestions for content and link placement – can have an immediate and lasting impact on adoption and continued use. For instance, in our 2015 State of Multichannel Customer Service Report survey, 61% said they have a more favorable view of a brand or organization that offers a mobile-responsive self-service portal. For customers wanting to use self-service more often, there’s nothing that will turn them away faster than thousands of pages of disorganized hyperlinks and information. Ask.com is an example of a brand that has created an organized, convenient and inviting self-service support offering, transparently putting the answers to its most frequently asked questions front and center, along with the name and friendly face of the person that’s helping to provide the answers at Ask. And while Ask also offers support ticketing on its portal, the word ticket has consciously been removed to support a more personalized experience, as Ask wants to make sure that no customer or user ever feels like a number when contacting support. Ask is also a prime example of a brand that is never content with its knowledgebase content, keeping it updated and adding to on a frequent basis based on its article rating and feedback tools, as well as page views and keyword searches. In addition, by regularly adding content, search engine placement increases. According to the State of Multichannel Customer Service Report referenced above, 75% of consumers have used a search engine to try and find the answer to their customer service question. 4. Don’t Make Your Portal an Island. In addition to the knowledgebase, a brand or organization’s web self-service offering should also include several assisted service options to include support ticketing, email, your organization’s customer service phone number and/or live chat. Don’t design your self-service portal as an island, but as a bridge. In addition, your self-service offering should be just as predominantly displayed and promoted as your customer service phone number or email. Address frequently asked questions in your social media streams; provide a link to your self-service offering in every email signature. Share the web address as part of your brand’s IVR messaging. These are just a few of the ways you can promote self-service use and adoption. Incorporating self-service allows brands to provide current and consistent answers, across channels, at scale. Not only does an effective self-service offering deliver customer convenience, but it also benefits brands through deflection of frequently asked questions, lowered costs and giving customer service representatives more time to spend on assisted service. Design with the customer in mind to achieve greater self-service satisfaction. Interested in the customer service statistics featured above? Want to see more? 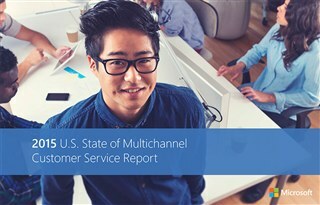 Download the just-published U.S. State of Multichannel Customer Service Report to find out which customer service channels are growing in use. Click the image below to download.